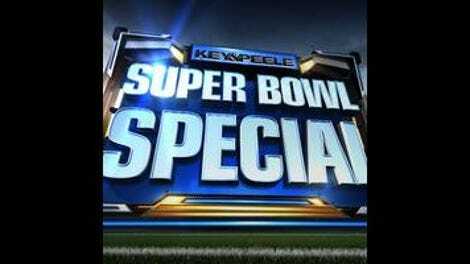 "Key & Peele's Super Bowl Special"
Making fun of professional football isn’t hard to do. I love football—but the ethical contradictions, hyperbole, and all-consuming self-seriousness of the enterprise must be acknowledged by any fan not blind (and/or blind drunk) with Super Bowl fever. Fashioning a sketch show around those contradictions, however, risks falling into cliché—dumb jock jokes, topical impressions, the looming specter this year of people solemnly saying the word “balls” a lot. A lot of comedy landmines there. Tying the show together is the Key & Peele version of the ubiquitous pregame show, with two ex-jocks (Key’s Bertram Skilling and Peele’s Dante Pibb) anchoring the fictional CCB sports network’s coverage of all things football. Here, the easy joke is at the expense of dumb ex-jocks, but the show, as is the case with Key & Peele proper, relies on performance to sell premise. Pibb and Skilling feel nicely lived-in, parodying the jockish joshing of the Inside The NFL crowd, the hosts’ lack of natural performing ease making the ribbing ever-so-slightly awkward. I liked Pibb’s subtle movements objecting to Skilling’s braggadocio about his Super Bowl ring throughout, Peele’s gift for getting under the skin of his characters always working to keep the bit alive. The progression of barely buried hostilities between the two carries through the show as they introduce a scattershot collection of sketches, a clever way to tie the proceedings together. Naturally, the big crowd-pleaser is the return of the “East/West Game” sketch (which was released online earlier in the week). The wrinkle this time is that, in addition to the roster of Key and Peele’s ludicrously named players, the guys are joined by some actual NFL-ers whose unusual names inspired the sketch in the first place, like the Packers’ Ha Ha Clinton-Dix, the Jets’ Leger Douzable and D’Brickashaw Ferguson (reportedly the genesis of the bit), the 49ers Cornelius “Tank” Carradine, the Giants’ Prince Amukamara, the Panthers’ Fozzy Whittaker, the Browns’ Ishmaa’ily Kitchen, the Cardinals’ Frostee Rucker, and, in a double callback joke, the Packers’ A. A. Ron Rodgers. 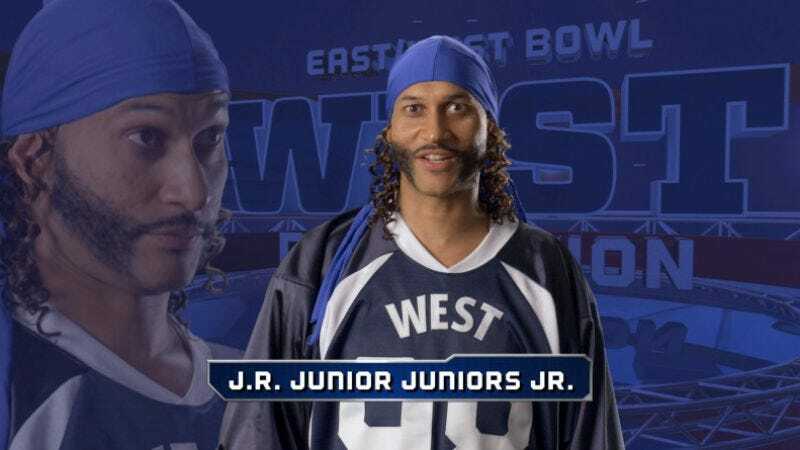 It’s a funny way to expand the bit—and the players’ willingness to play along with a gag that was always (if gently) at their expense is a testament to how influential Key & Peele has gotten over the years. As a fellow critic pointed out to me, there’s an uneasy element of racial joking going on here—the black Key and Peele building a phenomenally successful running sketch on the premise that, sometimes, black people are given unusual names. As a white guy who finds the sketch irresistibly funny, it’s worth noting. Pibb and Skilling are perfect vehicles for satire of the incessant jabber of sports talk TV in their segment trying to wring something to talk about from the most tenuous, increasingly absurd connections between the Patriots and Seahawks. The two weeks before the Super Bowl leave commentators free to yammer on unencumbered by anything to actually comment upon, here leading to Pibb and Skilling finding relevant connections between: Greta Van Sustren, Anderson Cooper, D.B. Cooper, NPR, macaroni and cheese, and Ben Vereen. The most biting segment of the night belongs to Pibb and Skilling as well, when a white guest pundit (Galavant and Psych’s Timothy Omundson) unconsciously displays the coded racial language endemic to sports discussion. I listen to an ungodly amount of sports talk radio, and it’s the sort of thing you can’t stop hearing once it’s pointed out, with white players being praised for their intellectual approach to the game and black players being lauded for their physical prowess. In an edgily hilarious montage of players, Omundson’s commentator throws out rapid-fire adjectives, Tom Brady’s “keenly analytical mind” contrasted with Vince Wilfork being “a freak of nature.” It builds up a momentum similar to the Richard Pryor/Chevy Chase word association SNL sketch, Omundson rattling off evaluations such as: “industrious,” “specimen,” “sticktoitiveness,” “miracle baby,” “a tactical mastermind,” and finishing up gloriously with a black player possessed of “magical powers he learned from his grandma.” Pibb and Skilling try to call him on it, but even they have to concede he’s right on in calling Rob Gronkowski “a silverback gorilla,” so they let it slide. Brilliant. Equally funny for different reasons, the interviews with Seahawks Richard Sherman (Key) and Marshawn Lynch (Peele) veer away from the expected easy gags, but in different ways. Key’s Sherman (a player known for his explosive tirades) instead gets upset about Oscar snubs, a silly swerve that nonetheless lands through Keegan-Michael Key’s performance, and the specificity of his objections. With barely suppressed anger, Sherman’s takedown of The Boxtrolls being nominated for Best Animated Film over The Lego Movie lives in the details, The Lego Movie’s “critical consensus” and “new and interesting take on the Batman legend” no match in his mind for “trolls wearing boxes—and that’s the funniest thing in the movie.” And Peele’s Lynch, while working the expected joke about Lynch’s deliberate non-responsiveness at press conferences, finds its comic engine in Jordan Peele’s physicality and repeated readings of Lynch’s nonsensical response of the day, “biscuits and gravy.” There’s no one on television right now who can imbue lines with as many layers of funny as Jordan Peele, and his way with this bit is a free class in wringing laughs out of the simplest lines. (There’s a bit where his Lynch pauses before resting both cheeks on the microphones in front of him to deliver the line that is simply masterful.) Throw in the twist where a frustrated reporter asks Lynch what he had to eat today (which throws Lynch off his game), and his reluctant response to Sherman ordering him to say what he really wants to say (“I just think the producers of Into The Woods did themselves a disservice by not including the narrator from the original theatrical production”), and this running joke just keeps giving. Not all the sketches work as well. The rookie combine sketch, the scouts, the portentous NFL Films parody about the player who could have been great (if only he didn’t run in slow motion)—none were bad, per se, but they certainly could have been stronger. But the episode culminates in the sort of bizarro conceptual piece that gives Key and Peele the chance to show off how great they are when things get dark, as the broadcast’s ubiquitous robot animation, Enos, becomes sentient and, as we discover, enslaves the world. With a disheveled Pibb and Skilling forced to soldier on, announcing the coming all-robot Super Bowl Fifty with fear in their eyes and desperation in their hearts, the special slips quite comfortably into hilarious madness. From the way all the graphics start gradually transforming into binary, to the revelation that they have eaten dead colleagues Craig Robinson and Gary Anthony Williams, to the fact that the former city of Topeka is now the massive site of the robot Super Bowl, to the fact that, yes, Allison Janney (subject of a running gag where she’s set to star in a sitcom, frontier miniseries, TV movie, supernatural thriller, and celebrity dancing show simultaneously) is the robots’ new God, it all slides deeper and deeper into delightfully unexpected weirdness, with Key and Peele’s performances grounding it all in an all-too-real madness. What does it have to do with the Super Bowl? Well, as the now-evil Enos states at the beginning of the robots’ reign, humanity, consisting solely of “over the hill alpha males obsessed with rings,” must be wiped out for their own good. The scout scouts (the scout potential NFL scouts) sketch wasn’t much, but any time Wendell Pierce is on my screen, I’m a happy guy. I need some Bunk, and his anecdote of finding a “Rain Man of sorts” at the bus station and taking him to a hospital where ”he discovered Jamaal Charles from an ultrasound” is delivered impeccably. As much as I enjoy Craig Robinson (and the idea of the Super Bowl special having a halftime show), that was just a long commercial for a particular soft drink. When former player Robinson demonstrates his fumble-causing “double oochie-coochie” tickle technique, I wasn’t the only one put in mind of fluffy fingers, right? Not a single “deflated balls” joke. Respect.